The swimming and diving championship of nationwide clubs of sector I in 2013 concluded on August 06, after 4 days of fierce competition. Results: In competitive swimming, Quang Binh team won first prize with 53 medals (of which 26 golds, 19 silvers and 8 bronzes ), followed by the Quang Ninh and Ha Noi teams. 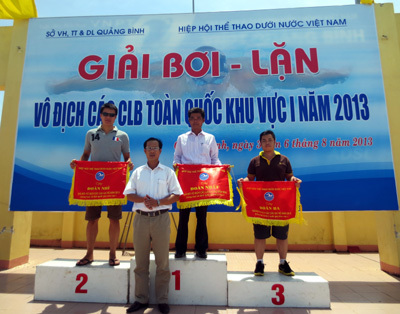 In competitive diving, teams of Ha Nam, Quang Ninh and Hai Duong won 3 top positions in the medals table. Quang Binh team ranked sixth with 11 medals (3 golds, 4 silvers and 4 bronzes).